The Fellowship was fortunate enough to obtain a copy of MEMORY CHALLENGE MARVEL COMICS EDITION and MONOPOLY: MARVEL COMICS COLLECTOR’S EDITION from USAopoloy Games. 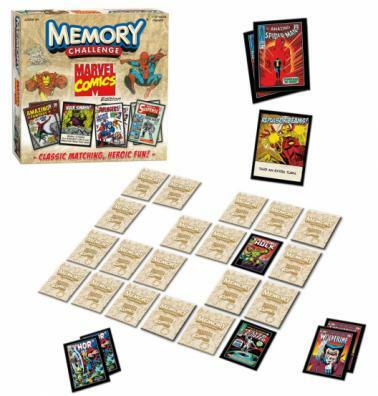 The MEMORY game is what you might think it is – collect more matching cards than your opponent. The cards for this version feature classic covers from the publisher. There is the addition of 10 POWER cards that has you do anything from discarding a match pair, to turning the direction of turns, to turning over additional cards in your turn. You are probably familiar with the game MONOPOLY, this is the same. However, instead of property, houses, and hotels, it’s famous Marvel Comics, bags, and cases. You’re not trying to have the most property, but the biggest comic collection…and of course bankrupt your opponents. We tried the fast version which changes the rules in order to complete a game in about an hour to 90 minutes. For example: you only need three bags (houses) on each property to get a case (hotel). It did indeed speed up the game. 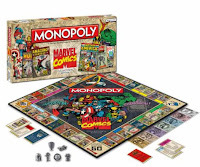 These are fun, classic games that are perfect for any Marvel Zombie! Both MEMORY CHALLENGE MARVEL COMICS EDITION and MONOPOLY: MARVEL COMICS COLLECTOR’S EDITION is in stores now, and available on several online stores including amazon.com, or www.usaopoly.com.